Since her days of competing on American Idol Season 3, Jennifer Hudson has become incredibly successful. She's had a singing career, and even dabbled in some acting, with her debut being the 2006 box-office hit Dreamgirls — managing to pick up an Oscar along the way. However, listening to her story, fans will learn that it hasn't been exactly smooth sailing for the entertainer. And while super inspiring, Hudson's recent Cosmopolitan U.K. interview shows some hard truths about what black women face in the industry. Hudson has literally defied all of the odds. The Chicago native comes from humble beginnings, and recalls working at Burger King while moonlighting as a singer in the Windy City's nightclubs before becoming a big name. Though what seems to be years of experience behind the mic, fans first learned of the exhilarating singer, with a dynamic voice to match, after watching her 2004 audition for American Idol. Her seventh place finish in the national singing competition was only the beginning, because just three years post competing for the title, the singer won an Oscar, a BAFTA, a NAACP Image Award, and a Golden Globe for her Dreamgirls performance. She'd later go on to star on Broadway, garnering critical acclaim and countless accolades throughout the years. Achieving such stardom in the industry, however, didn't make the entertainer immune from experiencing some of the very unfortunate things regular people of color face on a daily basis, however, like sexism and discrimination. 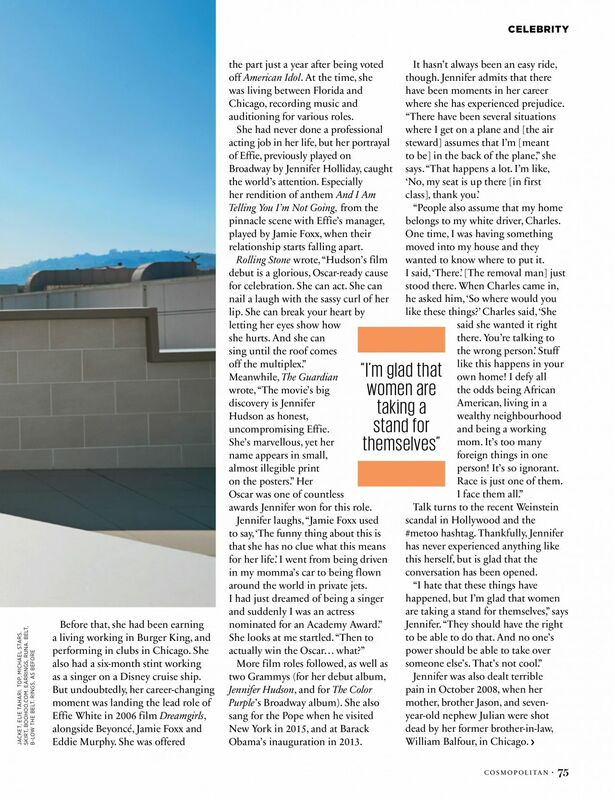 And in the Cosmopolitan U.K. piece, Hudson shared some of the heartbreaking details. In the interview, Hudson explained, "There have been several situations where I get on a plane and [the air steward] assumes that I'm [meant to be] in the back of the plane." The artist also told of another time where movers assumed that her home belonged to her white, male driver, instead of her. And while searching for the appropriate places to sit her belongings, they referred all questions to him. As if facing discrimination within the industry wasn't enough (like, Hollywood's disparaging pay gap, being type-casted for culturally insensitive roles, as well as the lack of roles available to women of color), not receiving respect on the most basic level from those you interact with is a total slap in a face. Sadly, these experiences aren't exclusive to Hudson. And she isn't the only black, female celebrity who's been vocal about discrimination, prejudice, and outright ignorance they've experienced throughout their careers. In a powerful essay shared on her Saint Heron website in 2016, and entitled "And Do You Belong? I Do," Solange talked a bit about what it's like for black people living in white spaces. To illustrate her point, the singer shared of her experience with being hit with a "half eaten lime" while dancing at a concert in a predominantly white venue in New Orleans. Actor Gabourey Sidibe wrote an essay for Lenny Letter in May 2017, detailing the time a Chanel saleswoman in Chicago directed her to a discount store when she asked to see a pair of glasses frames. In both cases, neither celebrity made it a point to identify themselves, because their celebrity shouldn't warrant respect — their humanity should. For Sidibe however, once fellow customers in the Chanel store recognized her, she was all of sudden given proper service by the same saleswoman who "dissed" her previously. "Honestly, if I walked out of every store where someone was rude to me, I'd never have anything nice," Sidibe wrote in the essay, and unfortunately, she's right. While shopping in a Swiss Hermes store in 2013, Oprah Winfrey faced an incident of discrimination, too. The media mogul asked to see a particular handbag (reported by Entertainment Tonight to be worth $38,000) that was secured behind a protective screen, and she was redirected to the handbags on the sales floor. According to Oprah, the sales associate thought that the accessory was a little too expensive for the billionaire. Sure, Oprah didn't say that any racial epithets were exchanged, but that doesn't stop this incident, or that of Solange, or Sidibe's from being deemed racist. Being dissed in a store by a sales associate who thinks their merchandise is out of your pay range is a racial, and sometimes sexist, micro-aggression. And having trash thrown at you while being black in a predominantly white space walks that fine "this is racism" line, too. Obtaining wealth, or even extreme levels of fame, won't help celebrities of color transcend race or make them immune from experiencing racism. And stories like Solange's, Sidibe's, Oprah's, and even Hudson's serve as the ultimate reminders of such. But hopefully by continuing to share these experience, the world will be that much closer to putting an end to discriminatory injustices.